Tomasz Różycki walks to work every day through the city of Opole, in the Polish region of Silesia, where he has lived since his birth in 1970. The fact that he is walking is important: the rhythm of feet on concrete and cobblestone, the familiar view across the Odra River, the regular length of time it takes him to reach his destination. Poetry has a long friendship with walking, good for pacing the flow of thought and establishing a strong rhythm. We are familiar with the idea in the Anglophone tradition from the late eighteenth century, when the Romantic poets transformed walking into a cultural and aesthetic act of taking pleasure in a landscape. For William Wordsworth, almost daily excursions on foot as well as longer walking tours functioned as a way to compose and revise poems that sprung from his meditations on the countryside. But what is important in Różycki’s daily walking is not so much any pastoral awareness it brings about but the fact that such rambling often leads to more sustained interest in the history of a place. Wordsworth’s pedestrian experience of the Lake District moved him to write a guidebook that traced the history of the region; so, too, Różycki’s paced knowledge of his part of Silesia roots him in a historical curiosity. In Colonies, his sixth collection, this curiosity blooms into an outright aesthetic obsession. In this inspired translation of Like a Straw Bird It Follows Me, Ghassan Zaqtan’s tenth and most recent poetry collection, along with selected earlier poems, Fady Joudah brings to English-language readers the best work by one of the most important and original Palestinian poets of our time. With these poems Zaqtan enters new terrain, illuminating the vision of what Arabic poetry in general and Palestinian poetry in particular are capable of. Departing from the lush aesthetics of such celebrated predecessors as Mahmoud Darwish and Adonis, Zaqtan’s daily, delicate narrative, whirling catalogues, and at times austere aesthetics represent a new trajectory, a significant leap for young Arabic poets today. When Valérie Rouzeau’s first poem sequence was published in France a decade ago under the title ‘Pas Revoir’, it met with immediate critical acclaim. These poems are an urgent, stammered lament for her dead father, a scrap-merchant, in which the poet’s adult voice and that of the little girl she used to be combine in an extraordinary blend of baby-talk, youthful slang, coinages and puns – a breathless delivery of tremendous power. 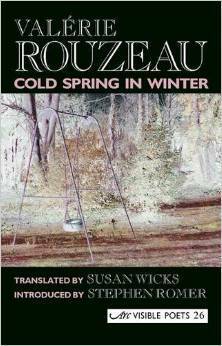 The influential poet and critic André Velter has described Rouzeau’s poetry as ‘violent in its capacity to exalt and disturb’. This quality comes to the fore in Susan Wicks’s remarkable translation, the excellence and ingenuity of which, in Stephen Romer’s words at the conclusion of his introduction to this volume, ‘make good the transposition of this pure and singular voice into English’. “Yesterday I lost a country,” Dunya Mikhail writes in The War Works Hard, a revolutionary work by an exiled Iraqi poet. Her first to appear in English. Here is an important voice that rescues the human spirit from the ruins, unmasking the official glorification of war with telegraphic lexical austerity. Embracing literary traditions from ancient Mesopotamian mythology to Biblical and Qur’anic parables to Western modernism, Mikhail’s poetic vision transcends cultural and linguistic boundaries with liberating compassion.